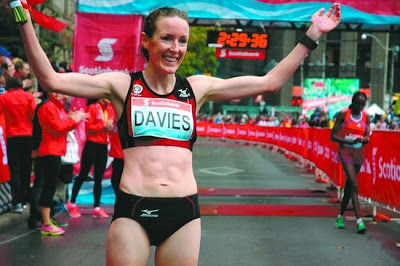 It has been two weeks since I ran the Toronto marathon and the time has passed so quickly. I did not think it would take me so long to recover after the marathon. I know that I pushed my body to its limits but I thought after one week I would be feeling back to normal. It has taken me nearly the full two weeks. I have used these two weeks to relax, plan my next phase of training, and spend more time with Gabriel and Lucas. I have really enjoyed the time and it has allowed my body and mind to take a much needed break. · I have had some tightness in my right hamstring and sacroiliac joint since the marathon. I went to get active release on this with Arthur Cuenco. Both have been feeling much better and my body feels ready to start gradually back training. If you are in the Ottawa area and need physical therapy or active release I would highly recommend Arthur. Wow . . what a weekend. 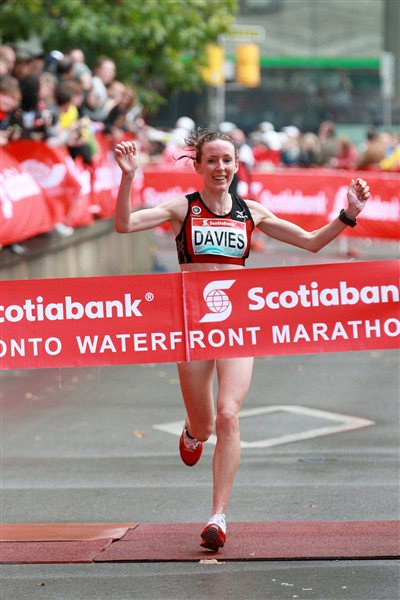 I am both relieved and excited after the Toronto marathon. Relieved because I had dropped out of my last two marathons and really needed to have a good race and excited because I ended up winning the Toronto marathon and running a personal best of 2:28.57. Based off my training my goal was to run under 2:30 however I never imagined that I would win the race :-) Below I will give a summary of the race weekend. On Saturday afternoon we had a technical meeting for all the elite athletes to go over preparations for race day. It was great to meet up with Krista Duchene and Lanni Marchant. Krista has been of great help to me during my marathon training and build-up to this race. As she is a mother of three young children she gave me plenty of very helpful advice regarding running during and after pregnancy and also about running nutrition as she is a dietitian. 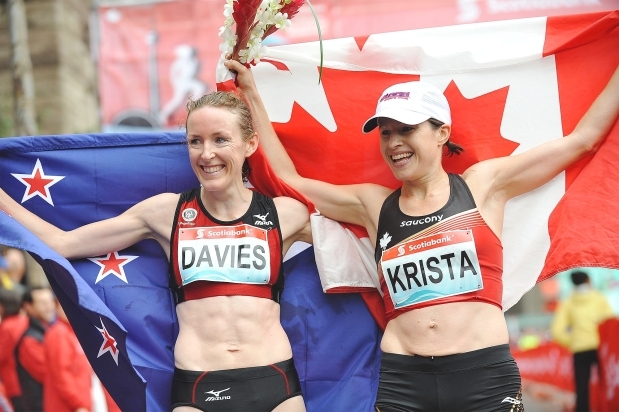 Krista and Lanni were going after the Canadian marathon record of 2:28.36. For this they had two pace makers to help. One of the pace makers was Rejean Chiasson a close friend. I was very happy that I could join their group as we all wanted to run around 3.30min/km pace. Running in a group and especially with pace makers is very helpful during a marathon. It allows you to concentrate on running and not so much on hitting pace every kilometer. Also at the meeting it was time to drop off our bottles that were to be put out on the course. In each of my eight bottles I had half a packet of gu energy gel with about one cup of water. I was very confident using gu as I had practiced in my training taking this to make sure it did not give me stomach or digestive problems. After the meeting it was time for dinner and more carbohydrates. Dinner before the race consisted of pasta with a tomato sauce, chicken and bread rolls. It starts to get hard during carbohydrate loading to keep eating (especially when you are not running much) but it is crucial during the marathon especially after 30 kilometers. 5.30 am on race morning the alarm sounded and it was time for my pre race meal of a bagel with jam and a banana. I had practiced my morning race routine for three Sundays leading up to the race to get my body accustomed to this. I wrote the splits I wanted to run for every kilometre on my hand so that I could check that I was on pace. At 6.30am we met in the lobby where all the elite athletes were escorted by bus to the start. I was very nervous by this point but having Lucas and Gabriel in the bus helped to calm my nerves. At around 8am Krista, Lanni and I started our short 10min warm-up. It was raining pretty heavily which was a little discouraging but I tried very hard to forget about the weather and just focused on running fast. The elite athletes were escorted to the start line. The canadian anthem was played and I made one last stop to the bathroom before finding Krista, Lanni and Rejean to line up at the start. 8.30 am and the gun sounded. The crowds were screaming and I was very excited to be starting. I got in behind the pace makers to hide from the wind and tried to settle my nerves and get in to a good rhythm. I felt very strong and relaxed and the pace felt comfortable. At the 8 kilometer mark Gabriel and Lucas were waiting to cheer me on which made me very happy and knowing they would be waiting at the half way point gave me extra focus to get there on on pace. We crossed the 10 kilometer mark in 34:42 and I felt great. I had to be patient and stay with the group as in previous races I have always gone out too fast and died in the end. I made sure that I got all my bottles however it was quite hard to see them on the elite tables. A few times I had to completely stop to make sure I got the bottle and one time I dropped it and had to circle back to pick it up. However I managed to get all my water bottles. I carried each bottle with me for about three or four minutes to make sure I consumed all the fluid gradually as I get the stitch if I drink too quickly. We went through 13 kilometres in 45:15 and 21.1 kilometres 1:13.39. I was feeling very comfortable through the half and decided at 25 kilometres I would gradually increase my pace. As I started to pull away from the group I was a little nervous hoping that I wasn't going too soon but I felt so strong and decided to go. I could see Radiya Adilo and Eyerusalem Kuma the second and third placed ladies up ahead and I used them as my focus. My goal was to gradually catch them. I caught up with them at around 27 kilometres. I tried to go past them quickly as I could tell they were hurting. Kuma dropped off and Adilo stayed. It felt good to be running with someone again and I focused on keeping relaxed and pushing the pace. We went through 30 kilometres in 1:44.50 and I was still feeling strong and on 3:30min/km pace. I could feel that Adilo was struggling to keep with the pace so I decided to pick it up a little bit. I started to pull away from her just before 35 kilometres and I tried to keep a faster pace. I went through the 35 kilometre mark in 2:02.31 which is still on 3.30min/km pace. Kilometres 37 to 39 were hardest of the whole race and I really had to concentrate on trying not to feel the pain. Just after 39 kilometres there was an overpass (bridge) which at this point in the race seemed like a huge hill. After I got to the top of hill I could see the first placed lady Agnes Kiprop up ahead which gave me the adrenaline that I desperately needed to keep going. I went as fast as I could down the hill and kept her as my focus. I caught up to Kiprop just over 41 kilometres and went as fast as I could past her. I have definitely never worked that hard in a race before and still had one kilometre to run. I was running on adrenaline by this point. I went through 40 kilometres in 2:21.12. I lost a lot of time between 37 and 40 kilometres and was now over 3.30min/km pace. I pushed as hard as my body would allow and kept checking over my shoulder to see if Kiprop was close. It was such a relief to see the 400m to go sign and now my focus was the finish line!!! Those last 400 metres were very emotional and it was such an amazing atmosphere. The crowd was cheering so loudly and I could see the finish line tape which I could not believe I was going to be running through. 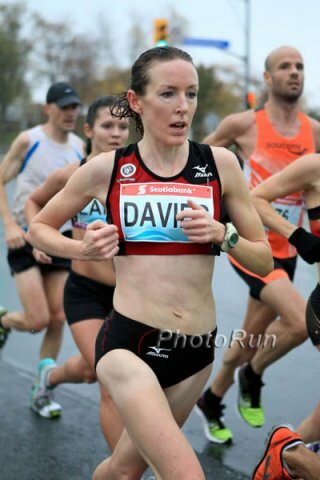 Running through the tape knowing I had won the Toronto marathon and had run nearly a ten minute personal best of 2:28.56 was a very surreal feeling and the best moment in my running career!! Alan Brookes the race director was waiting to congratulate me and gave me a hug which I really appreciated :-) The media were everywhere I turned and everyone wanted to take photos and get interviews. I was pretty exhausted and just wanted to lie down but the excitement took over. It was so great to see Lucas and Gabriel and to hold Lucas in my arms. Someone in the crowd had a New Zealand flag which I waved proudly. Soon after Krista Duchene crossed the finish line and we celebrated together. Holding our flags up for the media to take photos Krista used the term "mummy power ". Good friend, amazing athlete Krista Duchene and I celebrating together - "MUMMY POWER"
I am so happy with my result at the Toronto marathon and I am very excited for the future. I am hoping that my time was good enough to qualify for the IAAF world championships next year in Moscow. 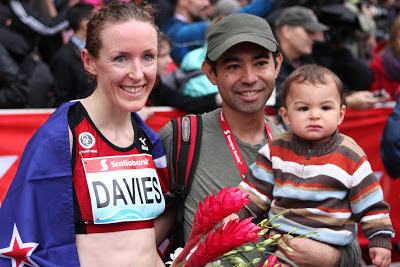 I have so many people to thank for their support: My coach Ian Babe, Mizuno and Arnold Tse, physical therapist Arthur Cuenco, Alan Brookes and the Canadian running series crew, Krista Duchene, Rejean Chiasson, Ken Parker, my Mum and Nan, Gabriel and Lucas. And thanks to everyone else who I have not mentioned. There are too many of you to name here. 3 days to go and I am getting more and more nervous and excited at the same time!! At this stage before the Paris marathon back in April I did not have these same nerves and excitement as I was really just hoping for a miracle that my injured sacroiliac joint would allow me to finish. This time around the build-up has been great. A few niggles here and there and a lot of physical therapy visits to get active release done but overall a solid gradual build-up. Thanks Ian Babe and Arthur Cuenco. 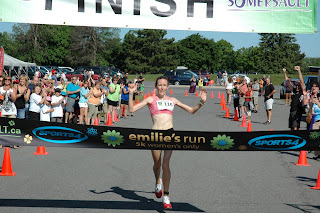 My tune up race was the Edmonton half marathon on August. This race went really well and I was very happy to run 1:11.50 - my new pb :-) This race was a good confidence builder. I felt strong during the race and recovered well afterwards. It has been great working with my coach Ian Babe. Even though he is New Zealand we keep close contact through Skype and he knows me and how my body works very well. He has a lot of knowledge about running and training and life in general which I have found very helpful. I have been enjoying the taper and my body has really appreciated the cut back in mileage. 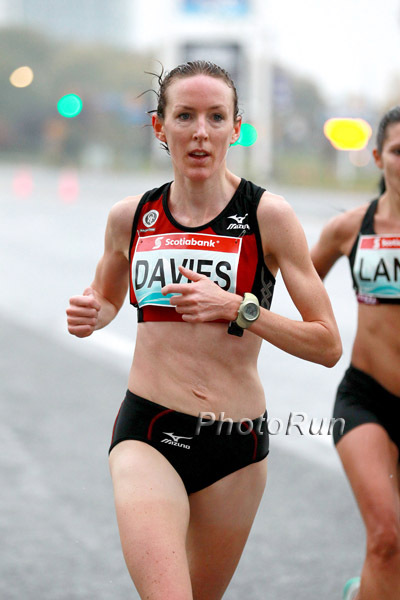 In the last few weeks before the taper it seemed as if every day some part of my body was tight or a little sore. Always very worrisome. I am very relieved that I did not get injured in this build up. I started carbo-loading today. I have been doing a lot of research over the last few months about carbo-loading and there is so much information and so many different ideas. As everyone is so different it is hard to write a blue print for the perfect nutrition plan although this would be great if it existed. I have been practicing in training so I believe m y nutrition is sound.I have been using the taper as a time to visualize and focus for the race. In the past I have always made the mistake of going out too fast and then not being able to hang with the pace at the end. On Sunday my goal is to run an even race from the start and hit all of my km splits. I will post an update after the race to let you all know how it goes. To end this post I want to say a huge thank you to Mizuno and Arnold Tse, coach Ian Babe, physical therapist Arthur Cuenco, coach of Ottawa Athletic Racing Team Ken Parker, the Ottawa Athletic Club and of course Gabriel and Lucas. Your support has been wonderful and very much appreciated! !